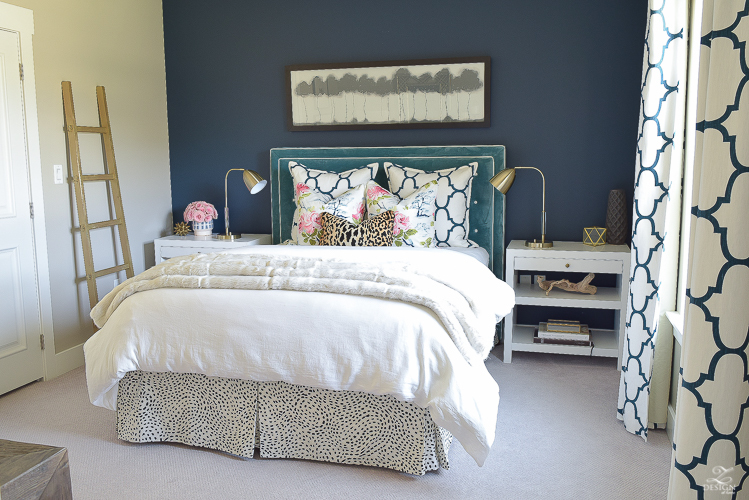 Hi friends and thanks for stopping by to see the updates to our cozy, chic guest room retreat! This room is so fun for me to play around with because it is the only room in the house that my boys don’t reside in (nor do they even visit it unless I need my husband to do some manual labor for me in here, hehe). Besides that, it usually ends up being mostly female family members that stay in this room when we have visitors so when I was considering what I would do in here to freshen up and modernize the space a bit, I knew it had to be something a little more on the feminine side, hence this lovely floral that I’ll talk a lot more in depth on in a moment. And, if you haven’t see the room the way it was before you can do that now right here before you start this update tour. 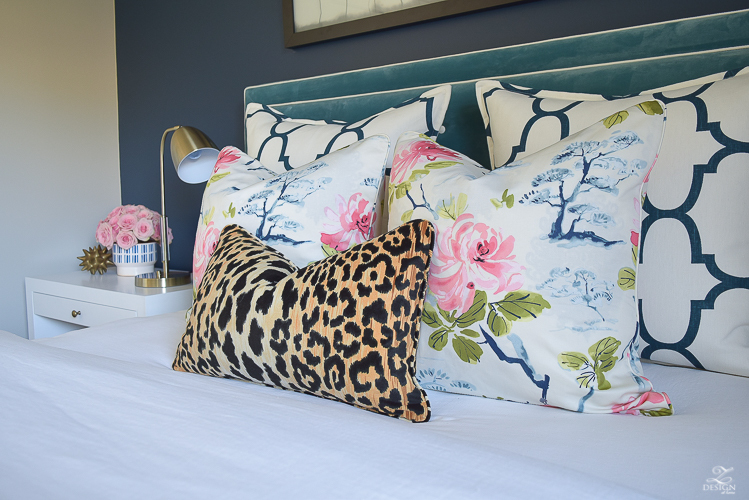 The room was beautiful the way it was but in my mind it was time to freshen things up a bit and I wanted to do so with not only this gorgeous floral fabric but with a pop of leopard, brass, and natural accents all of which I will share with you along the way in this post. But first, I want to talk about this lovely floral and the special place that it came from. To be honest I have never been much of a floral person, I mean like not at all. My decor usually tends to be not necessarily on the masculine side but, just not ever on the super feminine side. However, with the introduction of the modern floral over the past couple of years, the floral print has really began to grow on me. When I started my hunt for one for this space I knew that it couldn’t be just any floral and that it really had to speak to me. It couldn’t be overly floral (because that would remind me of an era that I don’t want to remember in design…anybody else with me on that? I realize I may have just dated myself here…yikes!) 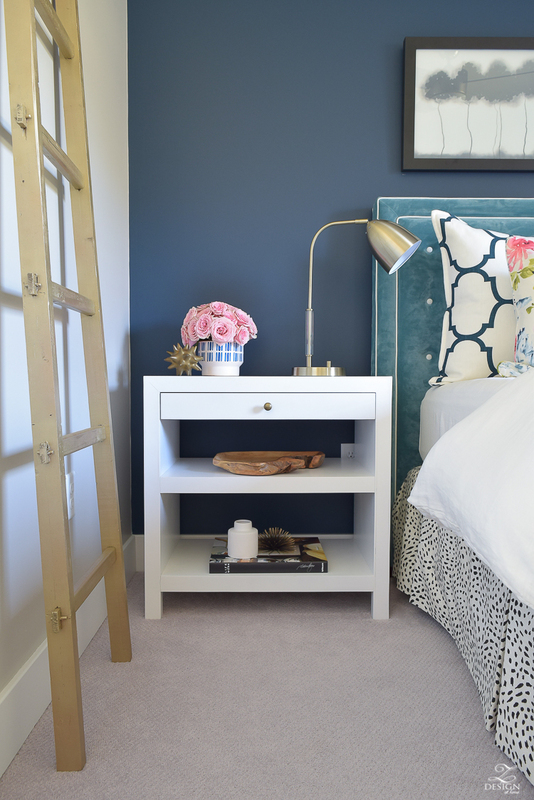 and it had to have just the right colors to fit into the scheme of this room, which was the hardest part because I knew the headboard nor the navy accent wall behind the bed was going to change with these updates. I also wanted it to be one I had not seen all over the place so sort of a new and unique to me floral is what I was looking for;)!! 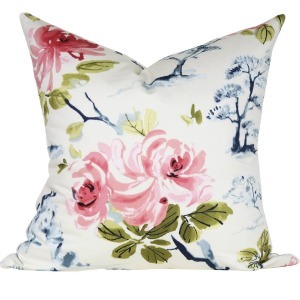 When I started my Google search for modern florals to have pillows made I ran across this one called Eastern Charm in Hibiscus from TonicLiving.com that I just couldn’t stop thinking about from the moment I saw it. 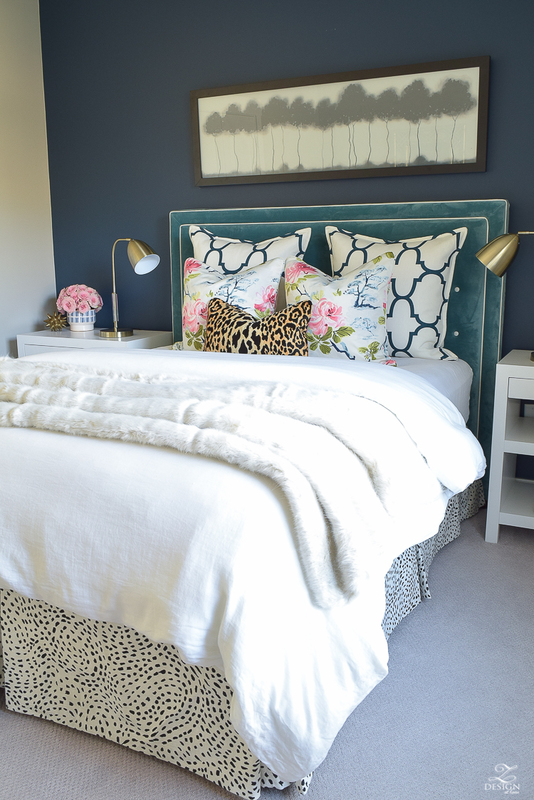 It’s feminine without being too feminine, it had just the right colors in it with a touch of pink I was looking for, and it went extremely well with the Bianca leopard print that Tonic Living also sells and that I wanted to use in this room as well. When I reached out to Tonic Living and spoke to Janine, the shop owner, about getting some swatches from her I knew after chatting with her that not only was this the floral I would choose, but I also knew this is a company that I would surely want to do business with again and again. Janine sent me a swatch of the floral but was also gracious enough to send me other swatches that would coordinate with the floral, which is a good thing because as projects usually go around here this one spiraled into more than just a few pillows on the bed. 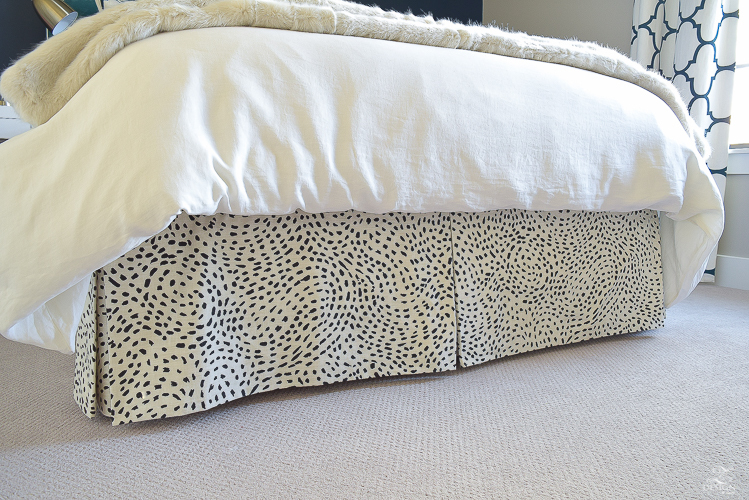 I had originally though that I would be able to keep my existing bed skirt but once I saw it with the leopard and floral swatch I knew it wasn’t going to work any longer (insert sign here). 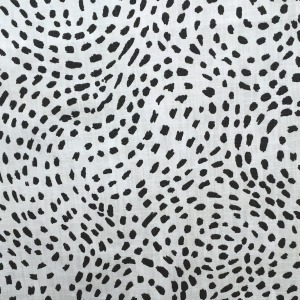 Luckily, Janine and her shop had sent me this black and white fabric, called Celestial Night that went perfectly with the floral and my existing bedding, which I ended up using for the new bedskirt. 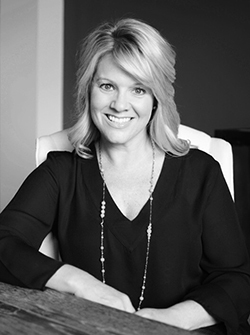 And that’s another cool thing about Tonic Living that I want to share with you today…with a modern, curated collection of fabrics and sewing services they are able to help you layer in a soulful blend of colour, texture, and pattern into your space with quality craftsmanship and a smile on their face the whole way through your project. 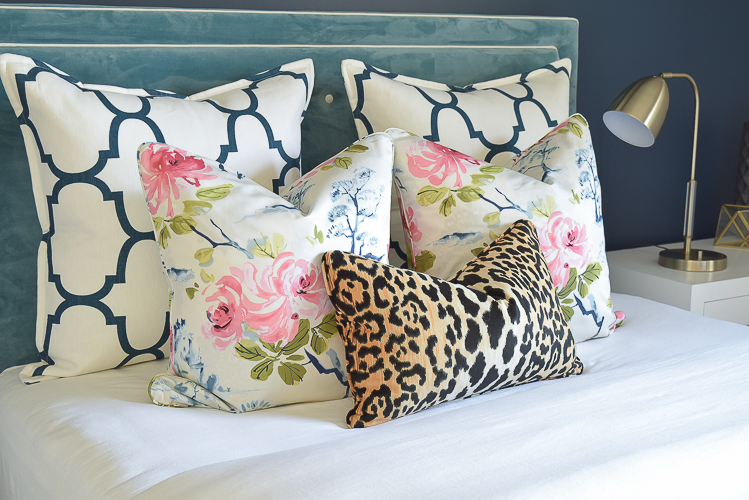 By now you probably already know that I love to have things custom made (so that my home is a carefully curated ensemble of items that look and feel like me and my family) so I loved that they were able to work with me to make my pillows and bed skirt to the specs I requested. I also love that for future projects I might have down the road Tonic Living can custom make anything from drapes, to roman shades, to bench cushions, pillows, shower curtains, and more. If you would like to check out their fresh, modern fabrics and products, and their beautiful shop based out of Toronto, Canada you can do so right here and I can promise you that you will not be disappointed. And be rest assured that if you are in the U.S. they ship from Canada worldwide and charge in USD so there’s no weird conversions or international charges shopping over the border. 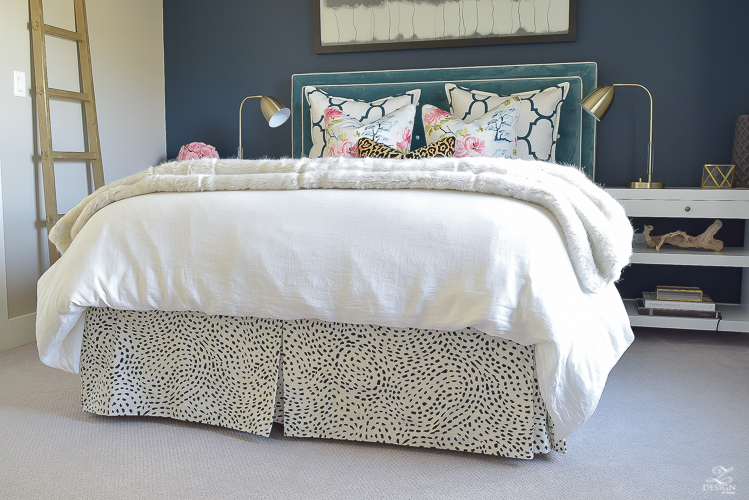 I highly recommend them and their work which in my book is by far some of the best in the industry that I have seen…I mean just look at this gorgeous custom bed skirt! Now that you’ve seen the textile updates on this side of the room, let me indulge you in the remaining updates I made to this space. Of course you may have noticed by now that I updated the lamps. Again, the previous ones were lovely (and I’m sure I’ll use them again elsewhere in my home in due time because that’s just how I roll) but I was looking for some modern updates in here so I was fortunate enough to find some brass task lamps with acrylic accents (similar here & here) at HomeGoods recently that I love! I also updated the rest of the the side tables with accents in brass and black to play on the black and white in the new bedding. On the right side of the bed I used this black vase, this small terrarium, this brass & glass shadow box and this and this book that I already had. The driftwood piece (similar here) is also something that I’ve had stashed away in my JoJo closet (my decor stash closet) and that I was excited to pull out for this project. Tip Time: The mix of metal, brass, wood, ceramic, and paper makes for a perfectly curated collection of things I love and that work together in harmony to create the perfect little vignette. 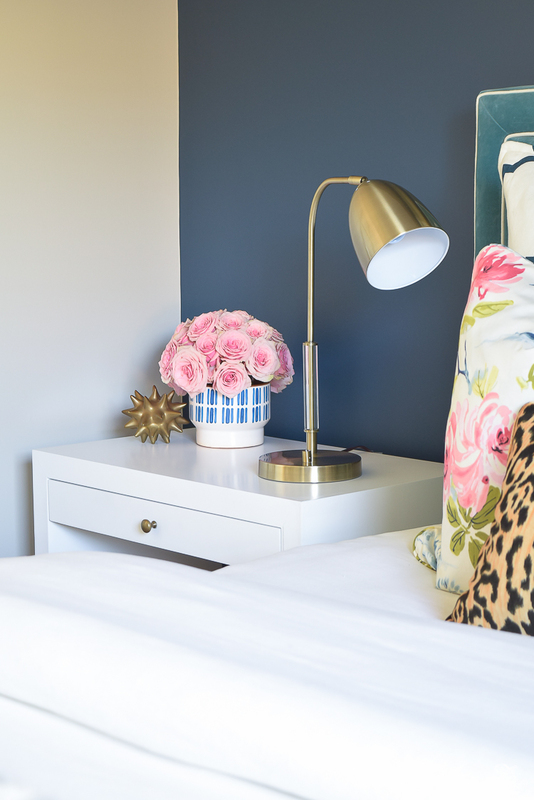 Always be sure to mix up the materials of your accessories and use items at varying heights so that your eye bounces around the space to take it all in. 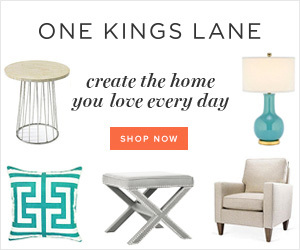 I talk a lot more about this here and here for more info on styling vignettes. On the left side of the bed I pulled out a wooden bowl/tray I’ve had for years (similar here), another black and white book I’ve had (this one) and this vase and this gold star accessory that I’ve had as well for the lower shelves, again creating a mix of materials that work together for a fresh vibe and update to this space. 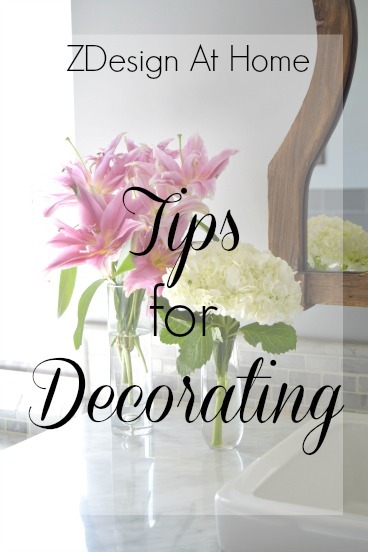 Tip Time: Books are one of the best items to use when styling a vignette because you can place them upright or my favorite way which is using them as a riser to raise your accessories. 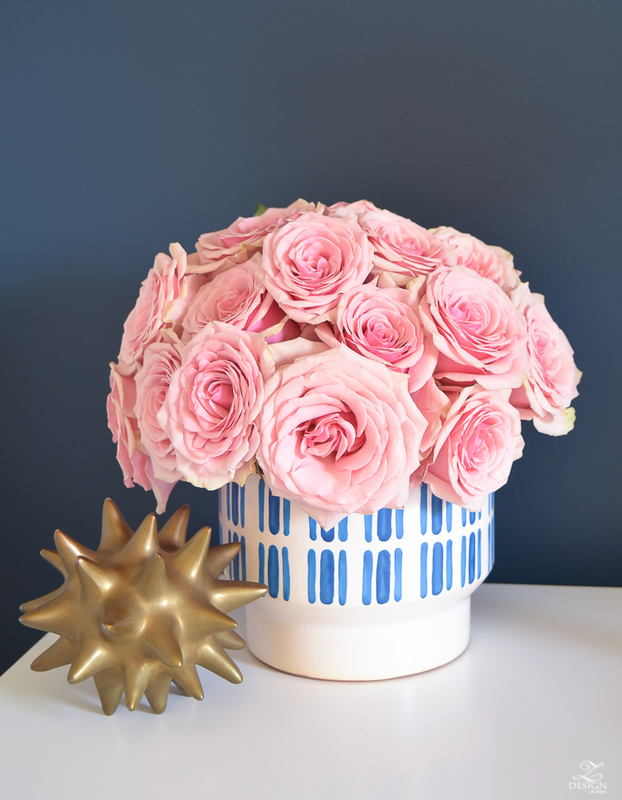 My favorite accessory in the whole room now is this blue and white planter that has a fresh, modern twist to it. I knew it was perfect for the space the moment I saw it and it looks amazing against the navy wall with pink roses…now if I can just find a way to keep pink roses in here all of the time!! I paired it with this gold sea urchin that I’ve had and that is a staple around my home in gold and silver. As it gets cooler here pretty soon, I can’t wait to find just the right throw to hang over the ladder (thinking of this one in soft rose) to pick up on the pink in the pillows. 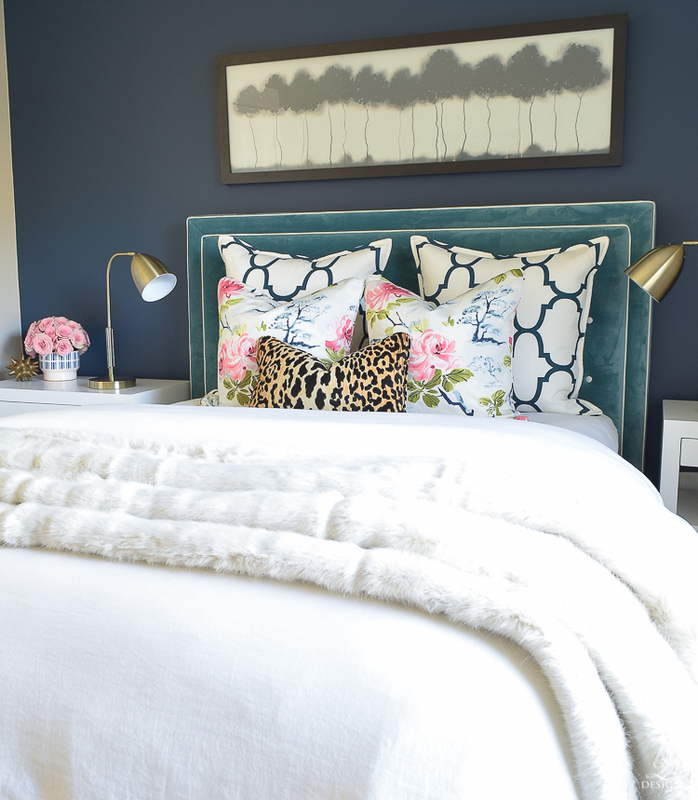 The next crown jewel of this space (besides the new pillows and skirt) and the icing on the cake in this room for me was this ivory faux fur throw! I can’t even tell you how much warmth it brings to the space and how it took this room from feeling like spring to having a good mix of materials that will work in any season. 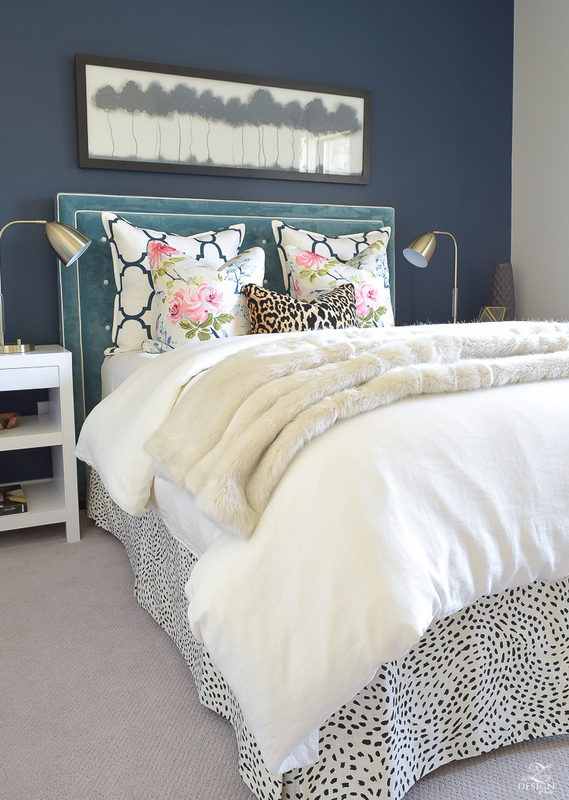 Tip Time: White or ivory faux fur works in fall and winter because of the warm and texture it brings to a space but it also works in spring and summer because it’s lighter in color. I talk a lot more about using and finding the best faux furs in any season here. 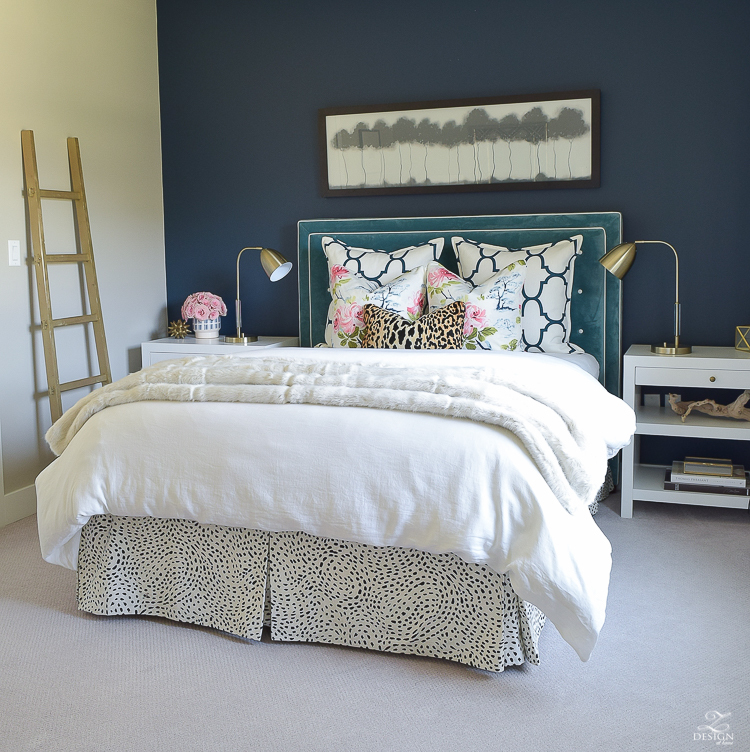 On a final note, I kept my linen bedding in place, my draperies, and my navy/white geometric pillows stayed as well along with all of the furniture and the art above the bed (similar art). 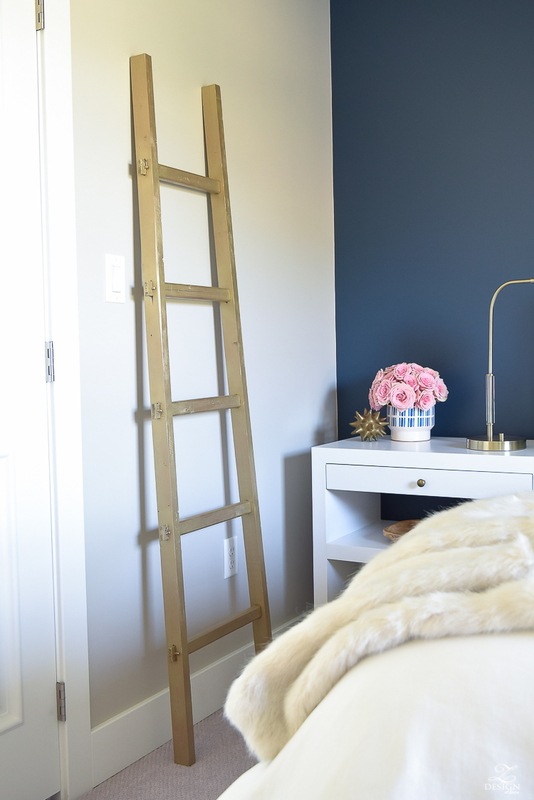 I did remove the antlers that were previously above the art to give the room a more feminine feel but it may or may not reappear somewhere else in the room soon…you’ll have to stay tuned to see. 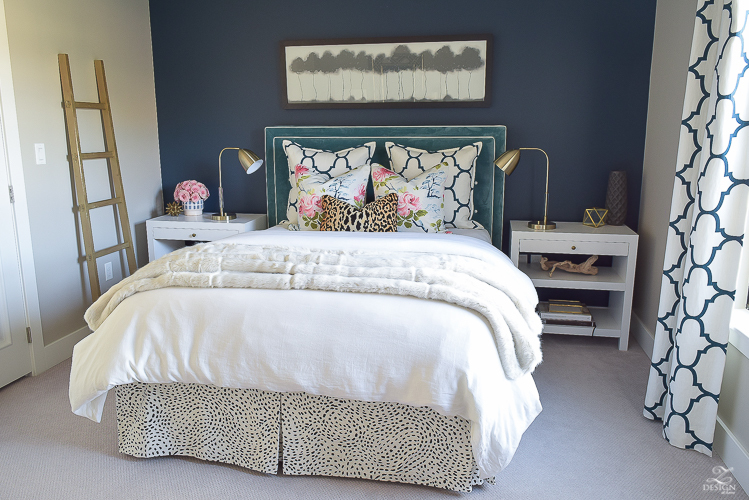 I hope you enjoyed the refresh of this space and I also hope you’ll come back in a couple of days when I reveal the other side of the room! 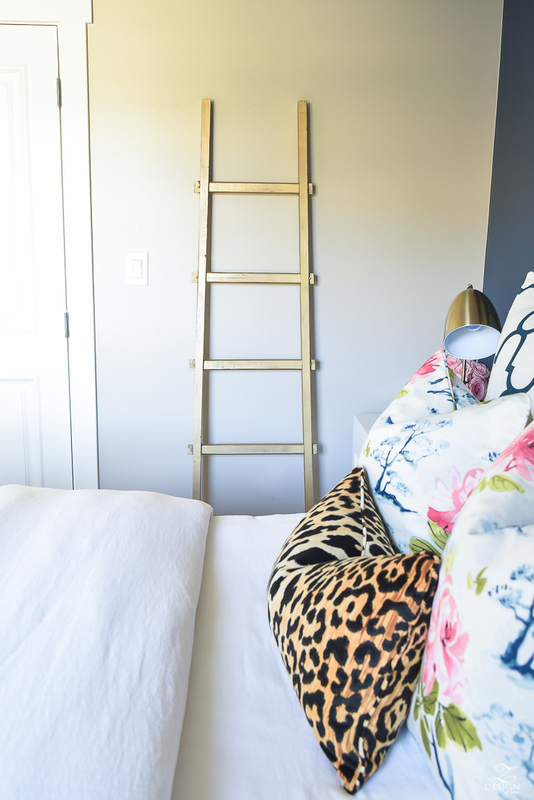 You’ll see a lot more leopard this time and you’ll also see how I shopped my home (and my attic) to completely redo this side of the room! And last but not least, don’t forget to check out TonicLiving.com along with the beautiful products (and more) that I’ve shared here with you today! Bree!! I didn’t think this room could get prettier but IT DID!!! 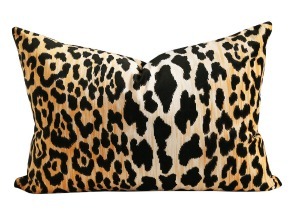 I’m so in love with all the changes and your addition of brass and of course the leopard! Looks out of this world! Love it! Bree, this is absolutely incredible!! I am loving this so much!!! Those florals! 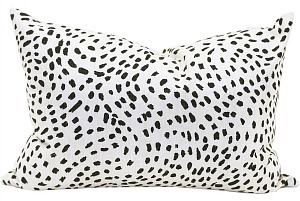 Bree, I absolutely love love love these pillows! I just ordered some from her the other day as well! 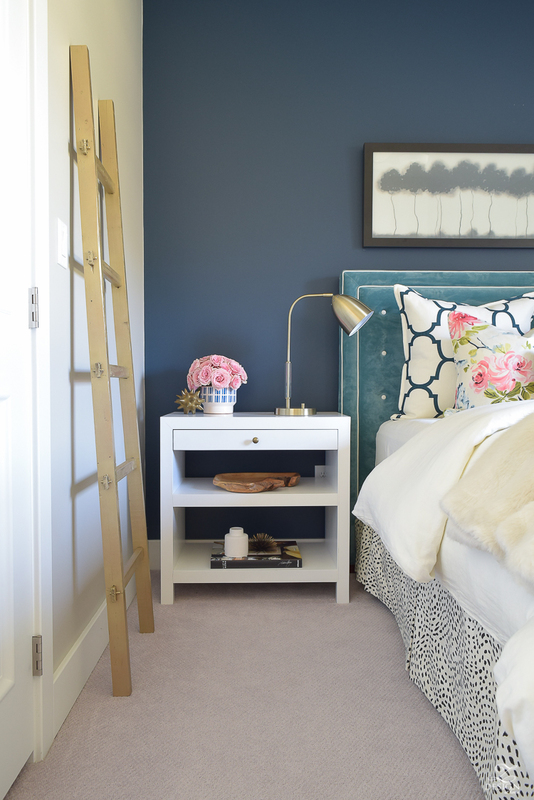 I love that headboard… The color is just divine! You are so good at mixing patterns and textures and putting things together! It inspires me! This is so beautiful… Well done! Bree, first of all I truly appreciate the slightly darker print of your post! Its easier to read and I am grateful you were responsive to my concern. 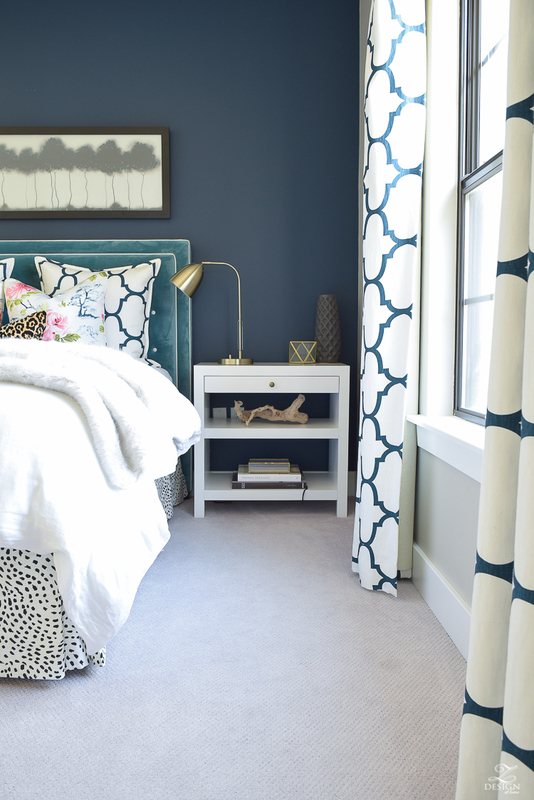 Second, I love this post and your ability to mix patterns and colors so beautifully! 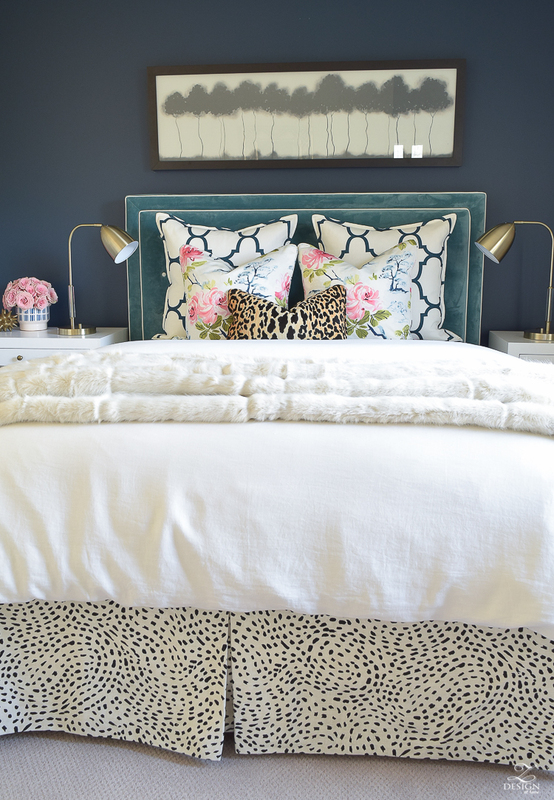 I would never have thought to put the leopard print with the other pillows but I love how it looks. 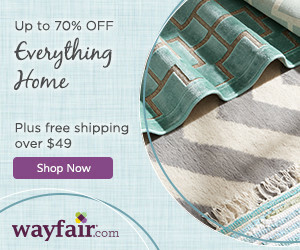 I also love the fabrics from your resource and plan to order some fabrics from them as I update several of my rooms. Thanks for another great post! 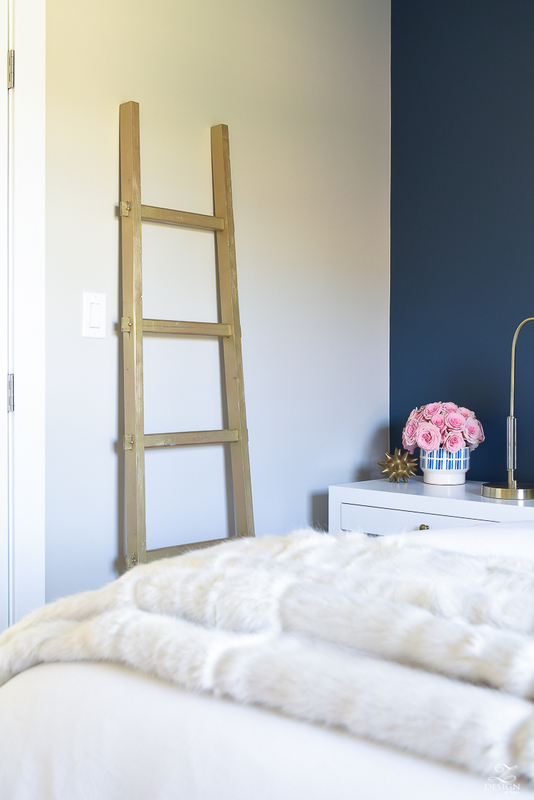 Bree, what is the color of the navy blue accent wall? I love it! Hi Kelly! Thanks for reminding me! I just added it to the bottom of the post but it’s Gentleman’s Gray by Benjamin Moore. Hope that helps a bit! Do you know where the artwork above the headboard is from? Bree you are so talented! I love the floral print and the entire space is truly stunning, beautiful job as always! Bree, you are soooo good! Honestly I would never have put the floral and leopard prints together but they work beautifully! 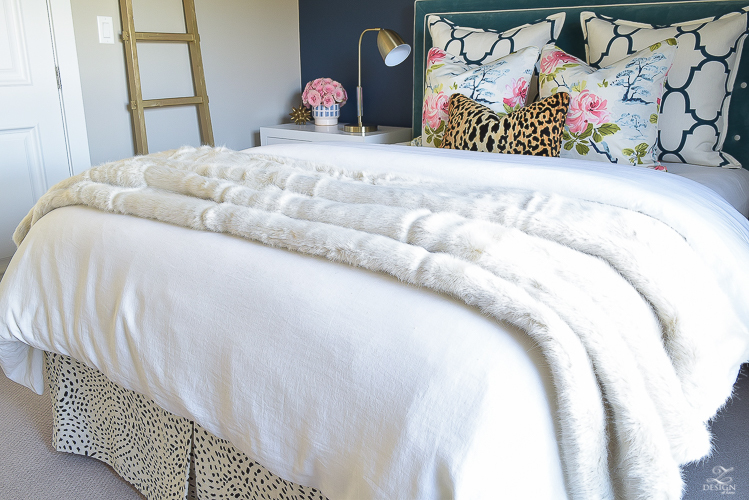 And that bedskirt is stunning – I’ve heard of Tonic Living before but haven’t ever been to their site so I’m off to check it out! Hi! 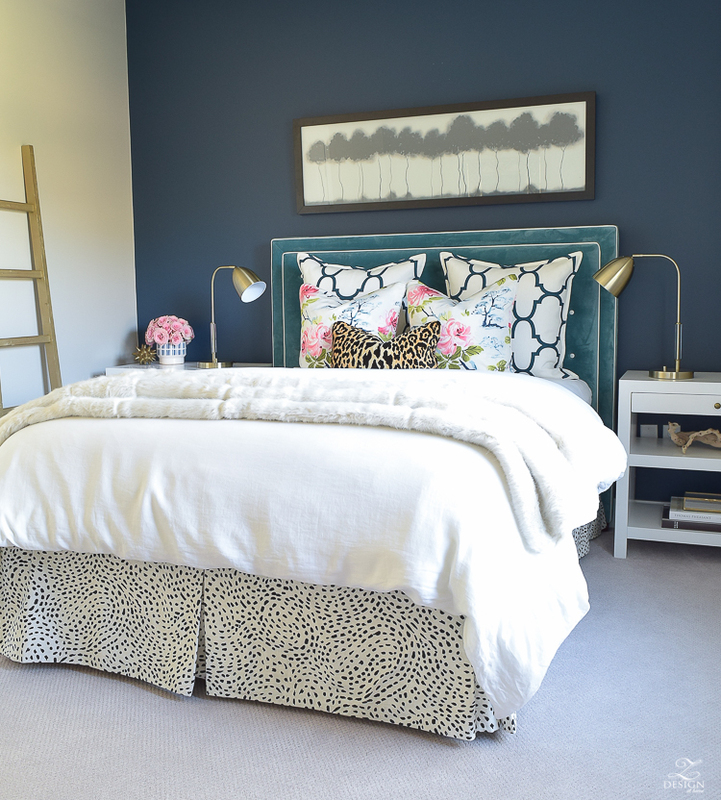 I LOVE this headboard! Where can I purchase it?